When connected, a migrant is no longer a lost soul. With a mobile phone or a computer connected to the internet, the home country and the family are never far away. Sociologist Dana Diminescu discusses the new reality that was unknown to Alpine migrants over the past two centuries. Since arriving in Mississippi in 1982, Walter Liniger from Switzerland has become a recognised specialist in blues music that he now teaches in U.S. universities. He also plays an original type of blues, mixing traditions and cultures like so many uprooted musicians, calling on two countries, two languages, but never at home. Except, of course, in his music, that of an exile. In New Orleans, the old quarter cultivates the memory of Claude Gurlie and Joseph Guillot, two architects from the Haute-Savoie in France who emigrated to the U.S. in the beginning of the 1800s. The story of two enterprising men from the town of Samoëns who met with fortune in Louisiana. At the end of the 1800s, Chile had not yet settled the dispute concerning the southern border with Argentina. To reinforce its claims, the government encouraged Alpine migrants to settle the extremely remote area then inhabited only by a few rare Patagonian tribes. One of them was the young girl, Marie Pittet, who, after many amazing adventures, set up a new life for herself just a short distance from Cape Horn. Émile Chabrand, one of the leading citizens from the Ubaye valley, set out in 1882 on a long trip, via India and the Far East, that took him back to Mexico, where he had spent 20 years. Ten years later, he published a colourful account of his world tour and received a prize from the Académie française. Excerpts. In the Ubaye, the Musée de la Vallée upholds the memory of migrations by local people. A heritage that is based, still today, on flows back and forth across the Atlantic. Thanks to the museum and numerous associations, contacts have been made that enhance the collections and, above all, the dialogue between the descendants of immigrants. Heart warming. Italy to California… and back ! After taking off to « work as a shepherd » in the Sierra Nevada, Bartolomeo Marino returned to his valley in 1909. With a thick wallet and, in his baggage, photographs and notebooks detailing his Californian adventure. A carefully preserved family heirloom. 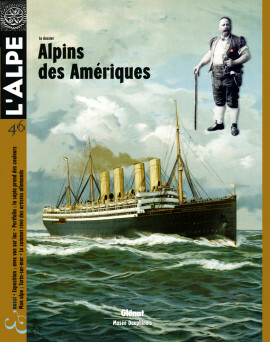 Addresses, internet sites and information to track Alpine emigrants on both sides of the Atlantic. In Annecy, a large exhibition looks at how Alpine lakes have been perceived since the 1400s. How have artists presented the lakes in their context ? What has been the reaction of the tourist industry ? See it at the Musée-Château and the Palais de l’Île from now until October 2009. The grand train in the mountains is the topic of a gigantic piece of embroidery carried out under the direction of Maria Ceppi and exhibited at the Musée d’Art in Sion. A surprising work of art whose design and execution present the two sides of a Swiss canton, at the intersection between tradition and technology. A chance meeting with a mountain man on a trail in the Aosta valley leads to a wonderful train of thought on our perception of the world, whether of mountains lived or mountains read. A contribution to our Intimate mountains series launched last winter in our anniversary issue. The first steps of photography in the Isère department in France will be exhibited at the Musée de l’Ancien Évêché, this fall in Grenoble. A large part of the exhibition will be devoted to landscapes, without neglecting the actual conditions and many uses of photography from 1840 to 1880. Over 200 unpublished photographs from private collections will be on show. In Bavaria, the Watzmann is an emblematic mountain that captures the eye. That of artists in particular. For over 400 years, paintings and drawings of the mountain have each, in turn, reflected the sensitivities and outlook of contemporaries. A demonstration in seven works of art.